Navjot Singh Sidhu, a cricketer-turned politician of India is seen in trouble after visiting Pakistan to attend the oath-taking ceremony of prime minister Imran Khan. An Indian newspaper, Hindustan Times reported that the Congress leader and now a minister in Indian Punjab government, courted controversy after he was seen hugging Pakistan army chief, General Qamar Javed Bajwa at the recent oath ceremony in Islamabad. He was slapped with a sedition case on Monday by a lawyer in Bihar for ‘insulting the Indian Army’ after he hugged Pakistan’s army chief Qamar Javed Bajwa at the swearing-in ceremony of Imran Khan as Pakistan’s prime minister. Sudhir Kumar Ojha, a lawyer who is known for indicting celebrities, alleged in his petition filed with chief judicial magistrate of Muzaffarpur town, around 100 km from Bihar’s capital Patna, that “Sidhu insulted the families of Indian soldiers killed by Pakistan’s army” by hugging General Bajwa and sitting next to Azad Kashmir’s president Masood Khan” on Saturday. Ojha said it was unbecoming of Sidhu to attend the celebrations in the neighbouring country at a time when the nation was mourning the death of former prime minister Atal Bihari Vajpayee. “Worse, his actions there put India on a low beside causing insult to the brave Indian soldiers like Lance Naik Paramjeet Singh, whose body was mutilated by the Pakistan army in Kashmir last year”, he said. 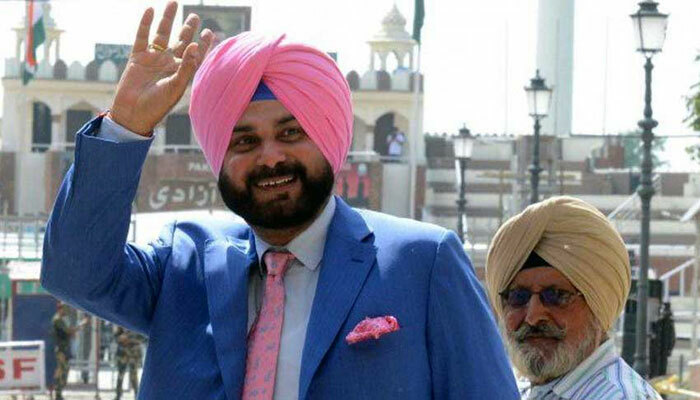 “I have urged the court to book Siddhu under IPC sections 124 A, 153 B and 504 for hurting the nation’s sentiments and order for his arrest,” he added. Ojha, who has lodged cases against celebrities including cricket stars, politicians and Bollywood actors over various issues, said the court admitted his plea and fixed August 24 as the next date for hearing in the case. The Bharatiya Janata Party (BJP) said Sidhu’s visit to Pakistan, especially his hug with Pakistan army chief, was “shameful”.